Eucharist services are held every Sunday (7 am & 9 am), Wednesday (10 am) and Saturday (6 pm). Youth Ministry – Our parish is currently in the process of employing a Youth Minister. Come to the Waters – program run in the parish to help families and Godparents prepare for their children’s baptisms in a friendly and supportive setting. Small Groups – small groups that are open and available to anyone inquiring and looking at God’s word and connection with this world. Taize Prayer – quiet and reflective service is held on the 2nd Wednesday of each month at 7:30 pm, All Saints’. Sunday School – the parish Sunday School runs during the 9 am service at All Saints’ church, during school term. Eucharistic Services at Nursing Homes – We have monthly Eucharistic services at Nursing homes in the Parish area. Choir – we meet at All Saints every Thursday night for rehearsal between 7.30pm and 8.30pm. All are welcome, no experience necessary! Mothers Union – our meetings are held at 10:45 am at St Matthews Hall on the third Wednesday of every month. Breakfast in the Park – a time when people gather together to share community and food. Held at Sid Loder Park, every Wednesday morning at 7:30 am. 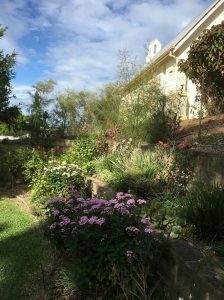 The Memorial Garden is for the scattering and interment of the ashes of loved ones, using the Christian service from the Anglican Prayer Book. It is thus available to anyone wishing to use this beautiful site for that purpose.